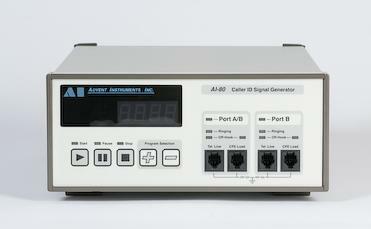 The AI-80 is a high performance Caller ID Signal Generator designed primarily for production environments. Built around a flexible signal processing engine, it supports all Caller ID signaling protocols and data transmission formats. This includes both the Bell 202 and V.23 FSK data transmission standards, as well as the various DTMF based standards. In addition to Caller ID testing capabilities, the AI-80 performs other standard telephone tests, such as: pulse dialing, DTMF dialing, flash timing, and network tone generation. Designed to be rugged and compact for use in manufacturing environments, the AI-80 operates by itself for simple testing applications without any other equipment. An optional I/O module can expand its capabilities by providing DC measurement capabilities, audio I/O ports, and digital I/O ports for creating small self contained ATE (Automated Testing Environment) systems. 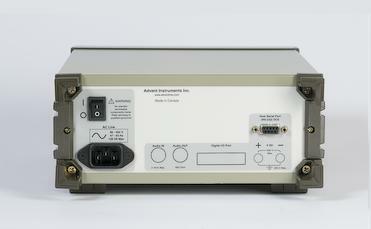 For more sophisticated testing applications, the AI-80 can be controlled by a host computer via a RS-232 serial port. The AI-80 comes standards with a large selection of programs for generating Caller ID signals in accordance to various standards. In situations requiring specialized and custom test sequences, the standard programs can be modified to suit the user’s need, or new applications can be developed. The A.I. WorkBench software, included with the AI-80, provides a development environment in which existing AI-80 programs, or new programs may be modified or created. Its high level language constructs gives sophisticated testing capabilities but with an easy to use interface. Once compiled, programs can be downloaded and stored into the non-volatile flash memory of the AI-80. The flexible nature of the AI-80 software system allows for easy field upgrades along with a wide range of capabilities. As program enhancements become available, the AI-80 can be updated by simply connecting a PC and executing the accompanying software. Included with the AI-80, the CID Lite software generates Caller ID signals for most systems in use around the world. By connecting the AI-80 to a PC’s serial port, the CID Lite software can emulate various Caller ID signals with a very easy to use graphical interface. The software supports both FSK and DTMF Caller ID in Type I (on-hook) and Type II (off-hook) modes. The A.I.WorkBench software is a programming development environment for creating custom programs for the AI-80. Using the A.I.WorkBench software, programs can be written in a high level language, compiled, and downloaded into the AI-80 for execution in its non-volatile memory. This allows for complete customization on the manufacturing floor, by defining and controlling the exact tests performed.